If you’re after the very best touring production that Inglewood currently has to offer, than look no further than the astonishing Corteo by the globally renowned performance arts group Cirque du Soleil!! Growing from small beginnings as a travelling troupe to becoming the world standard when it comes to contemporary circus, Cirque du Soleil’s shows are second to none. 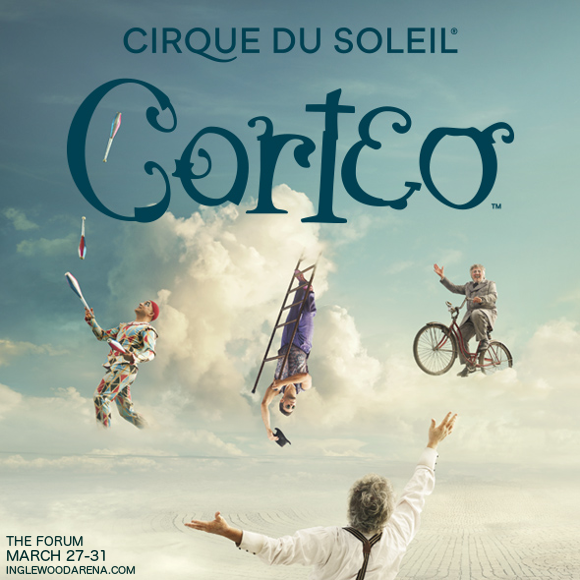 Don’t miss out – book your tickets to catch Corteo NOW while they last!! Even those who haven’t seen a circus show are familiar with the name Cirque du Soleil, such is their repute around the world. As with all Cirque du Soleil productions, Corteo is lavish, dripping with elaborate set pieces and sparkling costumes that clothe the performers. The performers themselves are of course phenomenal, in turn elegantly spinning from ropes to taking part in comedic clown chases. The music is atmospheric and engaging, accompanying the performers’ adventures with a unique orchestra comprised of some well-known – and some less-so – instruments. What are you waiting for?? Grab tickets for yourself and the whole family today! !